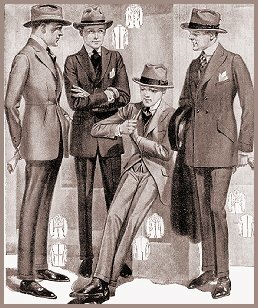 of the fashions of the 20's, 30's and 40's. In the late 20's the Jazz Musicians of Harlem pushed the boundaries of fashion with their big, bold and baggy ZOOT SUITS. 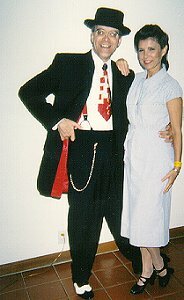 Their high waisted baggy pants, cinched in at the ankle, and their fully cut coats created a fashion statement that continues on in dance clubs around the world. Interested in learning more about fashion of the 1920s, 30s and 40s? Read This - Photos of Swing Camp Catalina. FABRIC is chosen on a per garment basis. Notify me of your color preferences and I'll provide a selection of fabric swatches to choose from. Or you can supply the fabric. All garments are CUSTOM TAILORED to your individual measurements. Looks great on the dance floor! Men's Novelty Vests - Holidays, Wild Colors, etc. Oxford Baggies originated on the campus of Oxford University, England, during the summer of 1925. The full cut of these pants and cuff with a circumference of 22 inches allowed students to easily slip them on over their beloved knickers, which had been banned by the University. 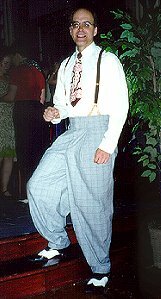 Unlike the ZOOT SUITS above Oxford Baggies were more socially accepted and worn by the masses. The belted back is unique! Jazz clothing surfaced in 1919 as a new music called Jazz was first being performed. This JAZZ SUIT, identified by it's extremely trim, tight/pinched look, was worn by those in the theatrical profession. As seen in World War One uniforms the jacket has a unique waist seam. 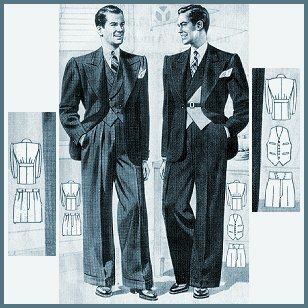 Perfect for the "Thin Man"
SACQUE SUITS were worn by the common man from the 1850's - 1920's. They were appropriate for all but the dressiest occasions. 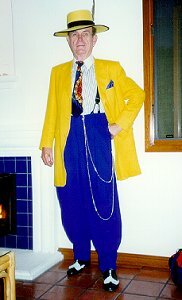 Full cut coat and trousers in a basic suit style. Pant legs are straight and without cuffs. Wear with or without a vest. If you're into the 20's this is for you!